this is how we were welcomed when we stepped off the plane and entered Dublin airport. 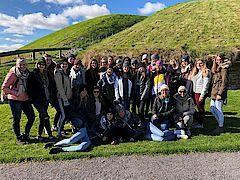 Finally, the 26 students of the 4BHL and their two teachers were in Ireland, ready and excited to discover this beautiful country! Once arrived in Bray, a small coastal town about 20 km south of Dublin city, we were greeted by a representative of the language school and the host families, who took us to their house which should be our home for one week. Indeed, we felt at home at once. We enjoyed Irish hospitality and excellent homemade (Irish) food. We attended language courses on four mornings. The lessons covered various topics such as Irish food, differences between the Irish and Austrian school systems, famous sights and history of Dublin and last but not least the Irish “leprechauns” (that is what Irish ‘Kobolde’ are called). At school, we had the chance to practice our language skills in various speaking exercises and games. Of course, the sightseeing programme was another highlight of this week. On Thursday we first had a guided tour through the impressive Dublin castle. The following day, we walked the Hill of Tara, which is the heart of Irish history and the home of the mystical Irish druids. We also visited the historic ruins of Monasterboice and its spectacular high crosses and had a guided tour of Knowth, a prehistoric burial site, older than Stonehenge or the Pyramids! On Sunday and Monday, we returned to Dublin once more to learn a bit about Irish Whiskey and the Jeanie Johnston Famine Ship. Of course, there was also some time set aside for us to discovere the city of Dublin on our own by answering the questions of our treasure hunt. 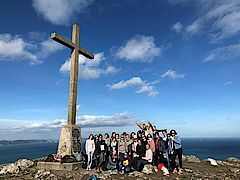 Further highlights were our Irish dancing evening, where we learned some traditional Irish dances, as well as the Bray Head hike and Cliff Walk from Bray to Greystones - one of Bray’s most popular attractions that offers stunning views of the East Coast. In our free time we either roamed the bustling streets of Dublin, one of Europe´s most dynamic capitals, or we sat quietly at the beach of Bray looking out onto the Irish sea. Now back at school in Austria “our hearts are still in Ireland”. It was a great experience and we would like to thank our teachers for organising this unforgettable trip!